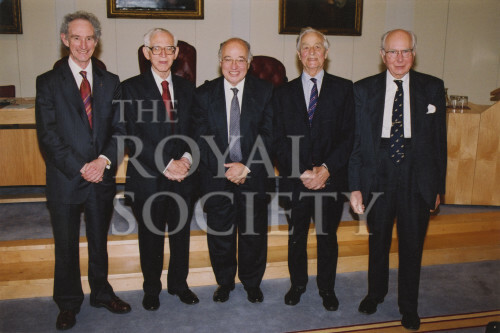 Full length group portrait of Presidents of the Royal Society including from left to right, Sir Robert May, Sir Aaron Klug, Sir Michael Atiyah, Sir George Porter and Sir Andrew Huxley. Sir Robert May, Baron May of Oxford is an Australian theoretical ecologist, he was elected a Fellow of the Royal Society in 1979 and served as President from 2000-2005. Sir Aaron Klug is a Lithuanian-born British chemist and biophysicist, he was elected a Fellow of the Royal Society in 1969 and served as President from 1995-2000. Sir Michael Atiyah is a British mathematician, he was elected a Fellow of the Royal Society in 1962 and served as President from 1990-1995. Sir George Porter, Baron Porter of Luddenham (1920-2002) was a Chemist and was elected a Fellow of the Royal Society in 1960, he served as President from 1985-1990. Sir Andrew Huxley (1917-2012) was a British biologist, he was elected a Fellow of the Royal Society in 1955 and served as President from 1980-1985.